The Jakoti Hand Shears are a popular choice for sheep farmers who like to shear their flock by hand as opposed to using electric sheep shears. Unmatched in design, quality, and performance in raw wool shearing, sheep farmers have raved about the high-quality carbon steel of these self-sharpening blades. 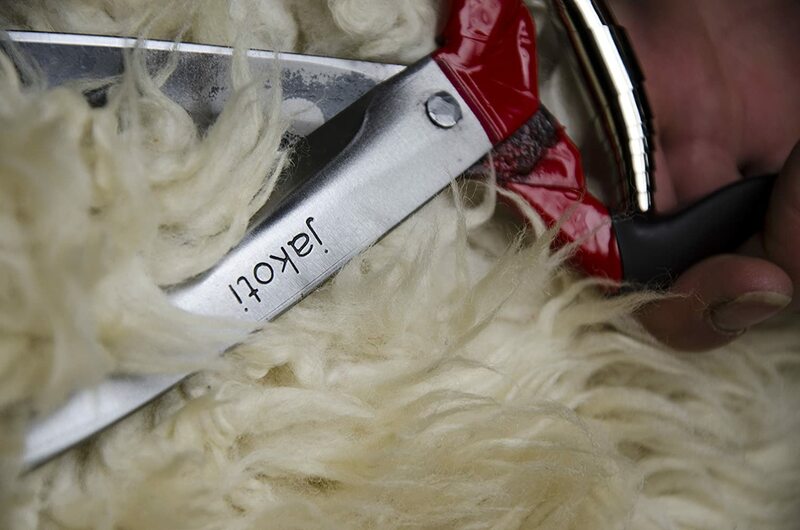 The handles are ergonomic and comfortable, and the low tension spring in these shears make them very easy to use over extended periods, preventing hand fatigue when compared to traditional sheep hand shears. While the Jakoti brand may not be a household name to farmers in North America, Jakoti Hand Shears are considered the gold standard by farmers in the UK and throughout Europe. we appreciate the design and craftsmanship of these hand shears, the carbide steel, self-sharpening blades of which measure just under 6" in length. This is a comfortable length to use when shearing sheep by hand, which allowed for extended periods of use without fatigue. The handles in particular were well-designed when compared to traditional, less-expensive hand shears. The Jakoti shears feature an ergonomic handle which was shaped perfectly, and allowed for comfortable use. The low-tension spring in these shears was another feature I enjoyed. Most of the sheep hand shears I had used previously relied on tension derived from the metal coil at the base of the shears to provide the tension for the blades to spring open after each clip. While that style works well, it generally will produce a lot of tension, which can result in hand fatigue from the effort required to close the shears for each snip. The Jakoti hand shears, by comparison, offer nearly effort-free use -- they spring open easily after each snip, but require less effort to close them to cut through the wool, a feature aided by the self-sharpening carbide steel blades, which hold their edge for much longer periods than their competitors. Are Jakoti Hand Shears Right for Show-Ring Fitting? The short answer is that I don't know. I only recently tried these shears, and used them for crotching out ewes, and for general shearing on the farm. They are excellent in this role, but I'm not sure they would be as good for the fine finish-work of preparing sheep for the show ring. I say this because of the narrower, rounded blades, which (it seems to me) would make it more difficult to keep the shears steady for a smooth finish while cutting across a Hampshire or Dorset while prepping their wool for the show ring. ​For wool breeds like a Romney or Columbia, where the wool is left raw, I think they would perform well, and be easier to use. If you show long or fine wool breeds, I could recommend them, as the combination of their handles, low tension spring, and self-sharpening blades would likely allow you to trim more sheep in less time while preventing injury to your hands or wrist from the repetitive motion. ​The Jakoti Sheep Shears are our pick for the best hand shears for annual or bi-annual shearing of your flock of sheep. While I generally prefer electric shears like the Oster Shearmaster for shearing my flock every year, if you prefer to use hand shears, then the Jakoti self-sharpening blades will make your job easy.